Best Homemade Chocolate Chip Muffins Recipe – Bakery Style! These homemade chocolate chip muffins rival any bakery muffins. They are big tall muffins with a tender crumb, and you can taste delicious chocolate chips with every bite! If your past attempts at making muffins at home produced sad little muffins that taste nothing like the muffins from the bakery, you just have to give this recipe a try. 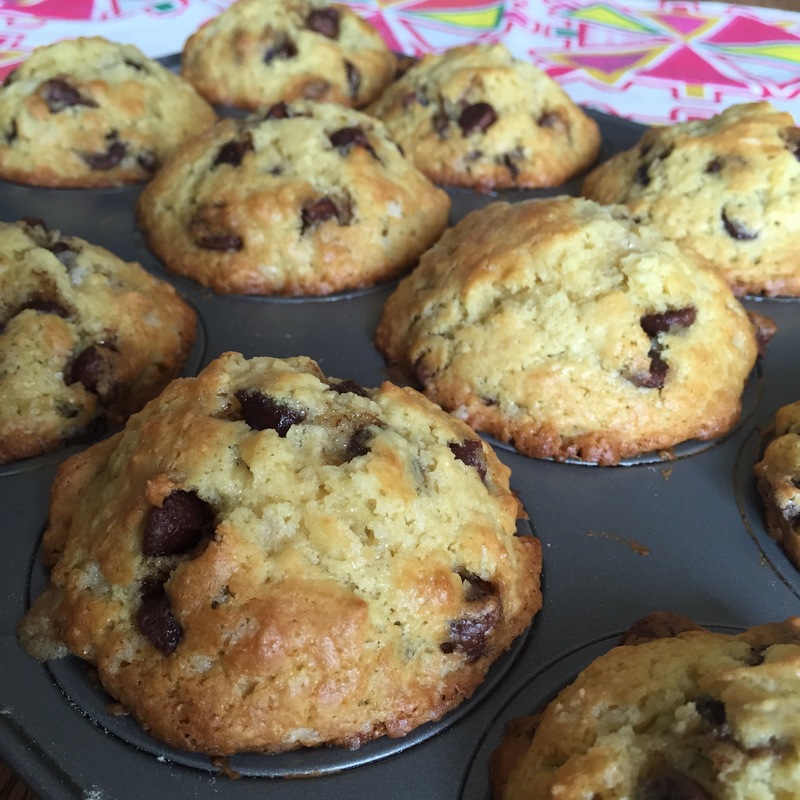 You’ll be amazed at the huge perfect muffins that come out of your oven, and you’ll be saying to yourself “I can’t believe I just made these!” This is the only chocolate chip muffin recipe you will ever need, you’ll never want to try another recipe after you make these amazing muffins. 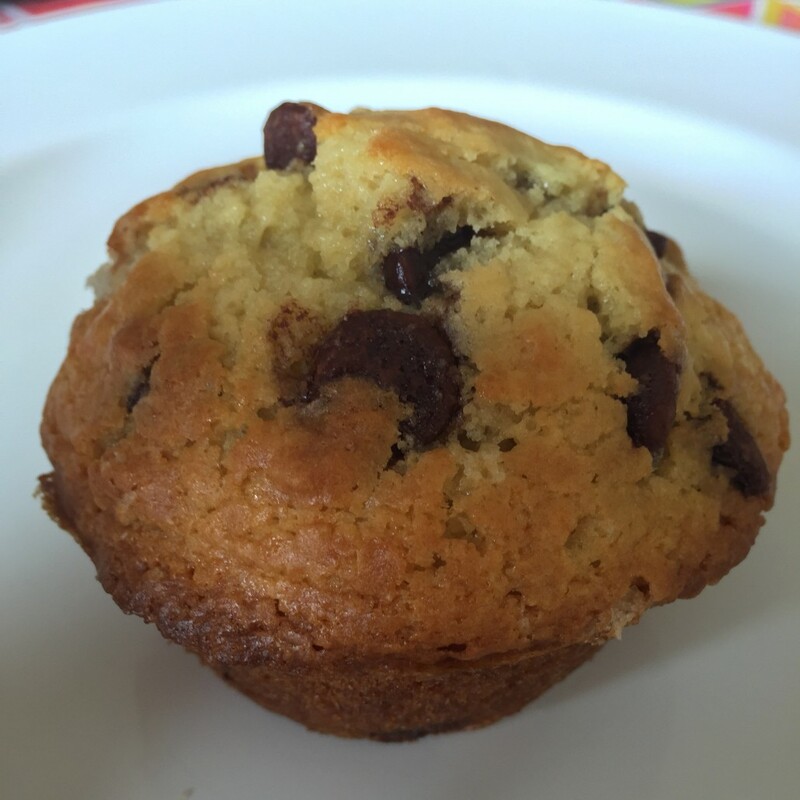 On the picture below, the chocolate chips are still melted as the muffin hasn’t yet cooled down 🙂 Can you imagine biting into this muffin – still warm from the oven, and the chocolate chips inside are still hot and melty! And as you can see, I don’t skimp on chocolate chips 🙂 Whenever I look at this picture, I get an intense craving for these muffins and need them right now! My favorite way of eating these delicious bakery-style muffins is for breakfast with a cup of coffee. Coffee with baked goods is my weakness… especially when the chocolate chips are added to the mix! This muffin is large enough and substantial to be a stand-alone breakfast. And if you want more protein, you can have a side of sausage, bacon or your favorite cheese! These tall bakery-style muffins have amazing texture, tender crumb and delicious chocolate chips inside. This is the best home-baked muffin you will ever make! Preheat oven to 425°F. Line a 12-cup muffin tin with the paper baking cups, or spray with non-stick cooking spray. In a large bowl,mix the flour, baking powder, baking soda, salt and chocolate chips. In another bowl, whisk the eggs with sugar. Add milk and mix. Add melted butter and vanilla and mix until combined. Pour the liquid ingredients into the bowl with the dry ingredients. Mix gently until just combined. Pour the batter into the 12 muffin cups. Put the muffin tin in the oven and bake at 425°F for 5 minutes. 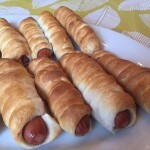 Reduce the oven temperature to 375°F and bake another 15 minutes. 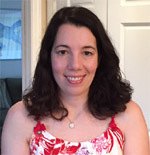 https://www.melaniecooks.com/wp-content/uploads/2015/05/IMG_1183.jpg 2448 2448 Melanie Mendelson https://www.melaniecooks.com/wp-content/uploads/2015/11/logo-new2.png Melanie Mendelson2015-12-12 14:08:432016-06-11 19:26:47Best Homemade Chocolate Chip Muffins Recipe - Bakery Style! 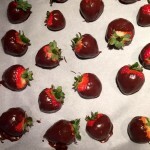 Love how quick and easy these are, and those chunks of chocolate are calling my name!! Those chunks are amazing, my favorite ones are the dark chocolate chips! If I have these muffins the next day, I warm them in a microwave so the chocolate chips get warm and gooey! When I make muffins myself, I’m so happy to be able to control the amount of chocolate chips, as the store-bought ones are often skimpy on the chocolate! I LOVE muffins, truly love them. But I always hated not being able to get them like the ones in the bakery at home. These look perfect! Love those high tops! What I also really like about this recipe is the high tops! In the past I’ve had some muffin recipes where the tops deflated, but these muffin tops stay big – delicious! These muffins look perfect. Love the soft and moist texture. Thanks Angie! Yes, you can see the texture on the pic where I cut the muffin in half – the texture is truly great! Love chocolate chip muffins and they look huge, must try since I usually get those puny flat tops. Thanks Tandy! Gotta send some chocolate chip muffins to South Africa now, LOL! 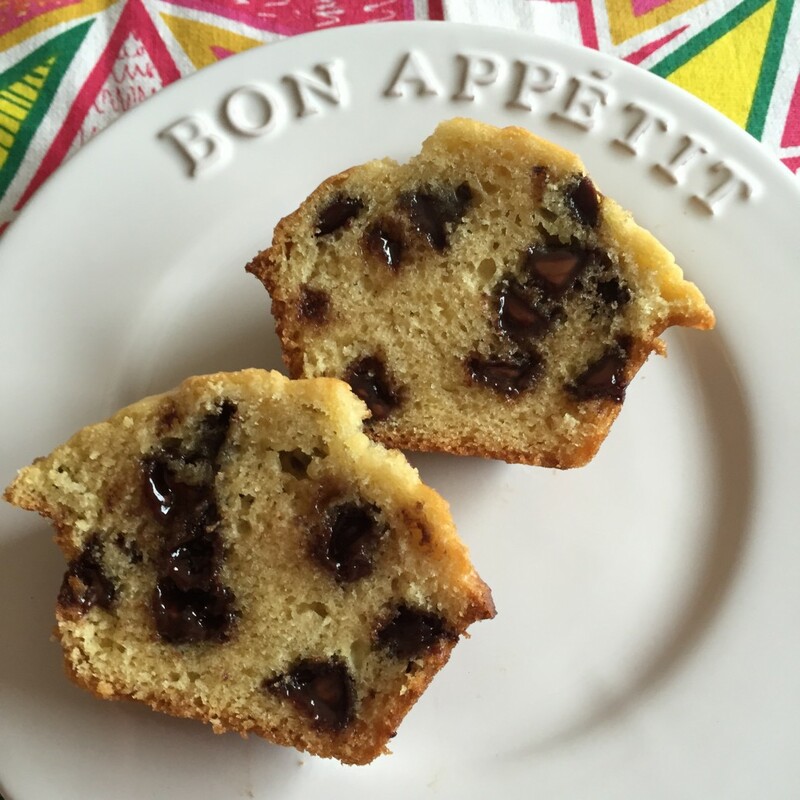 I have to admit, chocolate chips in muffins have it all over blueberries any day of the week. (Don’t tell the blueberries I said that!) Love these! Me too! Cocoa comes from a plant, so I guess that makes chocolate a fruit 🙂 My favorite fruit that is! Chocolate chip muffins are my favorite! I absolutely adore these. I usually choose blueberry muffins because that’s what I grew up with but these muffins look amazing. You’re right, they look like they came from the bakery. I’m sure you can substitute chocolate chips with blueberries 🙂 In fact, you just gave me an idea – next time I’ll make this muffin recipe with blueberries and post the result on this blog! Muffins are such a great treat and you make it look easy to make ones better than the bakery at home!! Thanks Laura! Yes, muffins are one of the easiest baked goods to make – just mix the ingredients, put in the muffin tins and bake 🙂 You should give this recipe a try! These are very, very good but have question. They were done about 23 minutes or so…checking with toothpick but not has dark on top as I would like. I was concerned that if I left in too long would really start to get over cooked and dry? All ovens vary, but yes, overcooking by more than 5 minutes can dry them out. Next time if you bake them on the top oven shelf, that will help the tops brown more. Wow – all those comments and only one other person actually made these? Normally I stay away from recipes like that…if no one made them you can’t get an idea if the recipe will work for you or not. Today however I took a leap of faith and tried these. I did make one change mind you – I added 2 tsp of instant coffee crystals to the milk and then heated it a bit (forgot to take it out earlier to get to room temp). The coffee with the chocolate chips is soo good! I’m glad I decided to try this, these turned out very yummy! I used King Arthur gluten free flour. Sprinkled sugar on top before baking. So good. My family loved them!! !